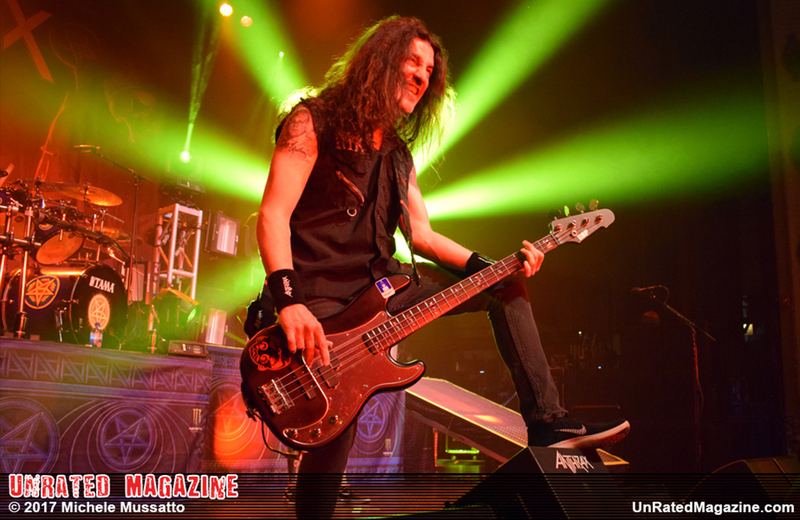 Bass guitar legend Frank Bello of Anthrax and singer-guitar player front man Jeremy DePoyster of The Devil Wears Prada both took time backstage with UnRated Magazine to discuss their latest critically acclaimed albums as well as life on the Killthrax Tour 2017 at the Arvest Midland Theatre in Kansas City, MO on a rainy Sunday afternoon. Both metal veterans looked healthy and happy with the tours success and the success of their albums For All Kings (released by Anthrax February 26, 2016 on Megaforce Records) and Transit Blues (released by The Devil Wears Prada October 7, 2016 on Rise Records). Anthrax and The Devil Wears Prada joined Killswitch Engage and Code Orange for this 33-city nearly sold out U.S. tour.